Which is smaller, 3 or 9? Boston Car Transport is known for its two types of shipping choices. Open auto transport and enclosed vehicle carriers. Enclosed transport is usually used for luxury car transport and exotic auto shipping. Open Auto transport is a more popular choice for the majority of our customers. It is an affordable way to move your car from one place to another. 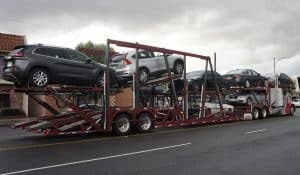 Making the right choice when it comes to dependable car carriers is very important. All in all, open auto transport will help you save money and lessen your travel stress. For a decade, Boston Car Transport has been offering open car shipping. With us, you can be sure that your car will reach it’s destination safe and sound. We employ the most reliable drivers. every driver that deals with open car transport have been in the business for years. Our standard shipping method is direct car shipping. This means we will pick up your car straight from your door and to any state in the nation. Every step of the car shipping process will be taken care of and professionally handled. Our goal is to make each of our customers happy. We will discuss pick-up and delivery dates with you to choose the ones that work best for you. Also, with open car transport, we can ship multiple vehicles at once. Boston Car Transport will make sure you get your vehicle or vehicles right in time! What you have to remember is that shipping your car using this method means exposing it to weather and road dust. So at the drop-off point, you can notice some dirt and flies on your car, especially after a really long way. At Boston Car Transport we will do our best to give you a great price for your open car transport. We also have discounts for our Boston Car Transport. Call us to get more info about our Boston Car Transport and to get a quote!